One day I was flipping thru the channels on TV and I fell in love with a woman named Katie. She had some crazy ideas like using moss for a table runner and slices of log for a charger plate. And I LOVED IT! So of course when I was asked if I wanted to review her new party book, Katie Brown Celebrates, I almost jumped thru Twitter. Again, I'm not one to spend hours making tiny do-dads for a dinner or party. But I am one who likes funky things for my home. 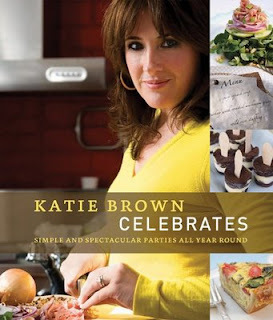 Katie Brown Celebrates gives you an entire year of ideas for party decorations and food. When I first got the book I opened a random page and let out a "I have to make this!" Gorgonzola Stuffed Potatoes. Yes, many if not most (I didn't bother to do the counting) of the recipes appear to be on her website, but having them all in one place is beautiful. Most of the recipes that made me say "Oh!" were fairly simple and not too many ingredients. Which is good for me because I get confused in the kitchen pretty easy. I've called Rachel a few times during a recipe. There is a honey mint mango salad recipe that isn't on her website, from what I can tell. Yes, I'm also that basic in my cooking that I need a recipe for honey mint mango salad. Of course the problem is actually getting myself organized enough to say, tomorrow we're having this and that for dinner AND buy enough product. My neighbors know that I'm that neighbor who is always borrowing a cup of sugar or a stick of butter. I swear I run out of basics faster than I think! This is a perfect book to give that someone special in your life who isn't a Martha, but does like to entertain. Maybe that's you! I relate to your desire for printed cookbooks even though so many fab recipes can be found on line.